The Tower Lobby is a room inside of the Haunted Towers in Luigi's Mansion: Dark Moon. The Tower Lobby is a small, two-floor room that the player can access by going into the left door inside the Courtyard. A small body of water separates this room. There's plumbing in this room that leads to the West Garden. On the first floor, the two doors to the north lead to the Greenhouse. There is a hidden door to the west that can be revealed by using the Dark-Light Device. This door will lead to the West Garden. On the second floor, the north doors lead to the Plant Nursery and the door on the east leads to the Skybridge. 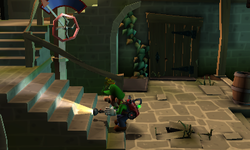 During B-1: A Job for a Plumber, there is no water to allow Luigi to cross to the other side, so he must go through the Greenhouse to get to the other side. In B-2: The Pinwheel Gate and all subsequent missions, the plumbing leading to the West Garden will be invisible by Spirit Balls. In B-4: Pool Party, the Tower Lobby has large orange flowers that attempt to crush Luigi. There are also several spiders present. Starting on B-1: A Job for a Plumber and all other missions after, Luigi can walk under the stairs to find a secret alcove with an emerald. This page was last edited on May 1, 2017, at 21:08.